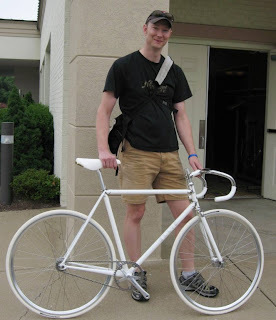 I was trolling around on the Cirque website last night and found this shot that Dale Brown took of me with Todd's bike at the 2008 Cirque. Wayne Bingham, the current organizer of the Cirque, contacted me recently to ask if I would consider giving a brief talk about my experiences as frame builder. I was flattered and more than happy to accept, so look for me to be attending the Cirque again this year. In other news, I haven't been updating the blog as much recently, but I've been pretty busy getting frames and bikes ready for the show. Stopped by Jason's today and saw both the 29'er and Steve's frame getting prepared for their paint. I'm really excited to see the color I choose for the 29'er on the bike, it's always tough to imagine the whole bike finished from the 1" x 2" color chip, but Jason assures me it'll be hot. 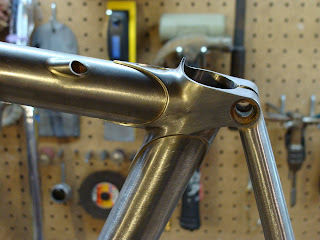 Here's a little teaser of Steve's frame, it's what I'm calling a "modern classic". I'll post more pics after the show, but if you can make it to Indy, stop in a check it out for yourself! The Car is Packed, Tomorrow NAHBS!